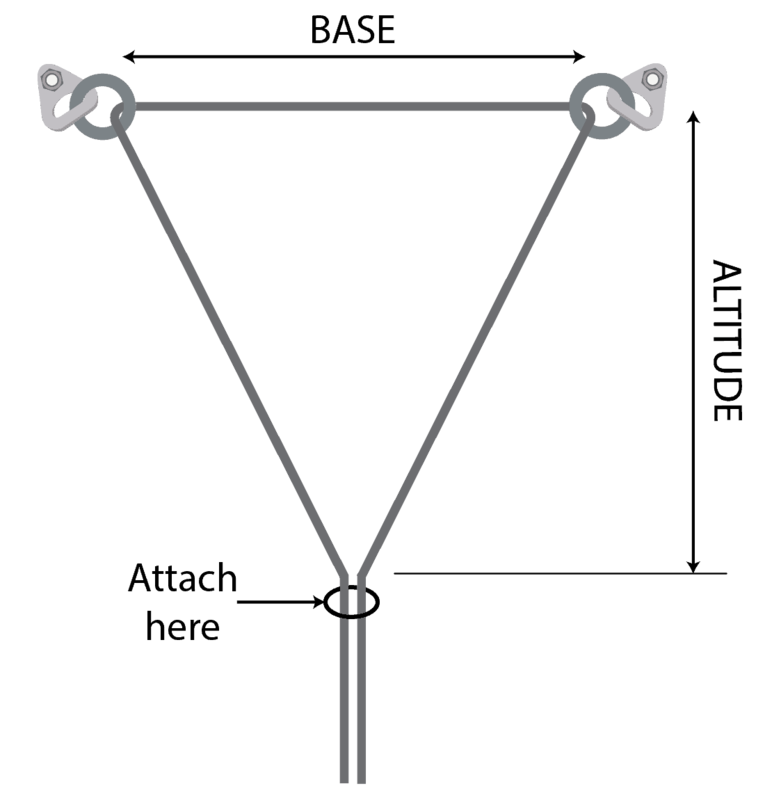 Have you ever been told never to use the American Death Triangle for 2-point anchor rigging as it has a pulley effect on the anchors and is considered ‘bad’ or is ‘dreaded’? In this article, we will consider the American Death Triangle in more detail and see what’s going on. We will explain how the American Death Triangle (ADT) works in as simple terms as possible with no trig equations to be seen. The aim is to give you a set of principles to assess your rigging in the field. To help you work things out, there is a 1-page download of the Vector Forces Guide further on in the post. 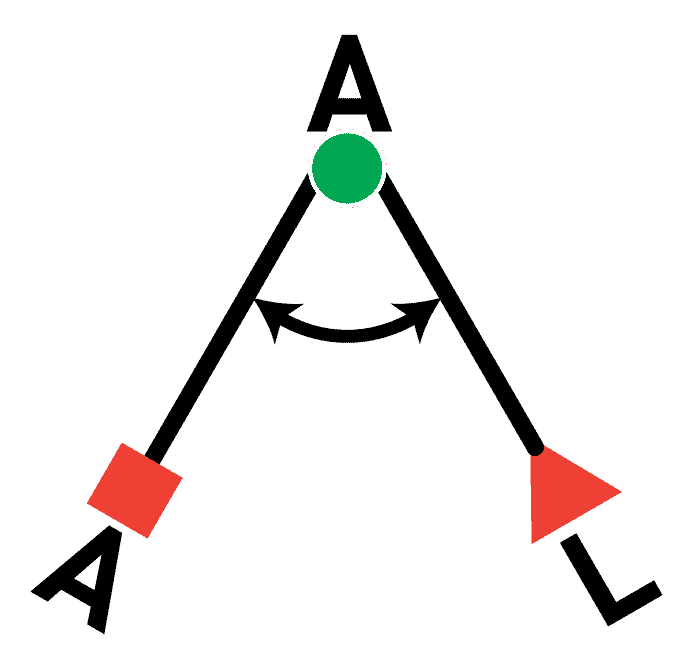 American Death Triangle (ADT): Where an anchor sling (or rope) is threaded through a two-point anchor (A) and forms a triangle as a continuous loop, with the load (L) attached to the sling as the focal point. 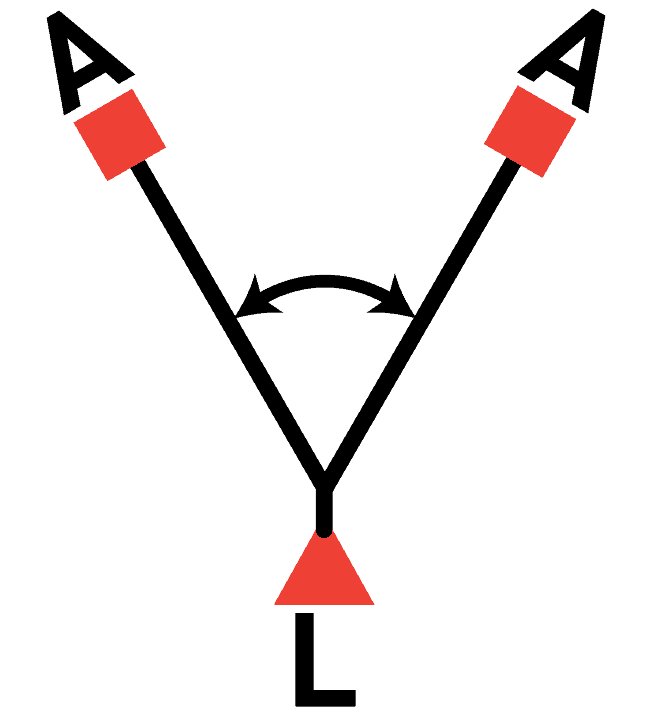 Two-point load sharing anchor: In the context of this article – where two marginal anchors are joined together in a V-shape with a knot fixing the strands at the focal point. The anchor points share the load evenly to create a system to hold the intended load plus a sufficient margin. For marginal anchors, angles are kept to 90 degrees or less. 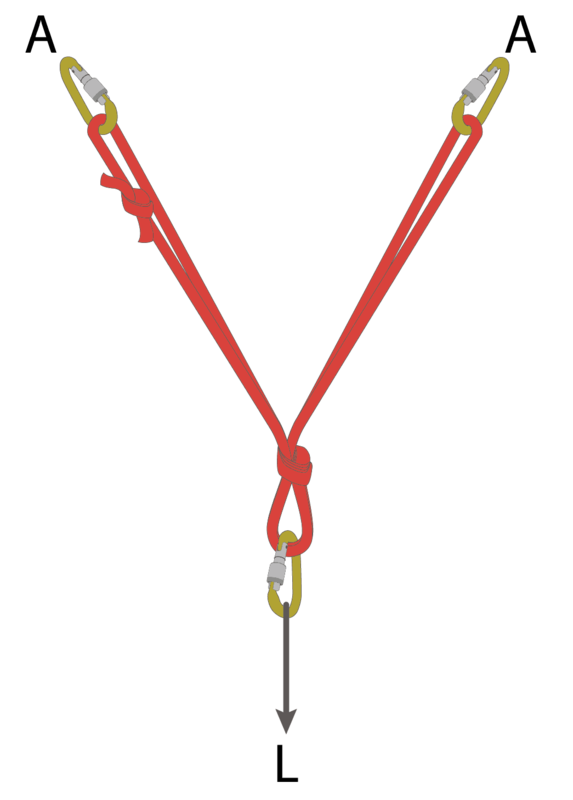 For example, a two-strand sling anchor tied with an overhand. The triangle formed by the ADT is an isosceles triangle (except for a 60-degree equilateral triangle, however, for simplicity, let’s treat them the same). There are two equal sides are known as the LEGS. The angle (and point) formed by the legs is the focal point and known as the APEX. The third side of the triangle that is not a leg and runs between the two anchors is called the BASE. The two angles formed by the intersection of the LEGS and the BASE are equal and are known as the BASE angles. All internal angles, when added together, will equal 180 degrees. So, if we know the APEX angle we subtract this from 180 and divide by 2 to get the BASE angles. e.g., APEX angle is 40 degrees therefore 180-40 = 140/2 = 70 degrees for the BASE angles. 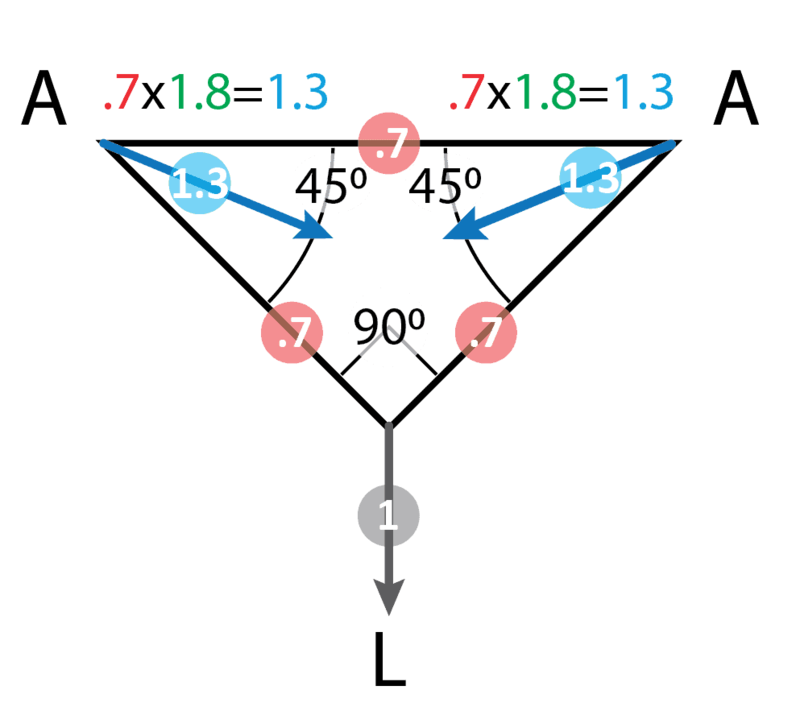 The ALTITUDE is the perpendicular distance from the base to the APEX point. Factor: Proportion of load applied where the load is equal to 1. Rather than use percentages we need to convert them to factors to make our life easier for multiplication as the load could be any number. A factor is the same value as percentages but represented as a decimal. e.g., a factor of 0.6 is the same as 60%, a factor of 1 is 100%, a factor of 1.3 is 130%, etc. Anchor angle: An angle formed by a 2-point V-shaped anchor. For the context of the article, it is the APEX angle. 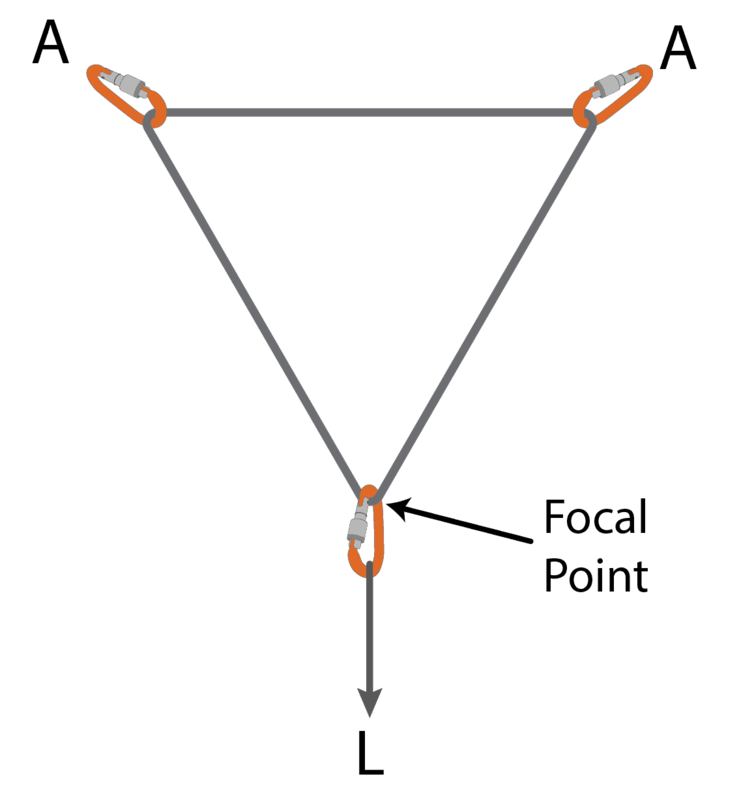 Directional angle: An angle formed where a rope bends around a carabiner or pulley. For the context of the article, the directional angles are the BASE angles. 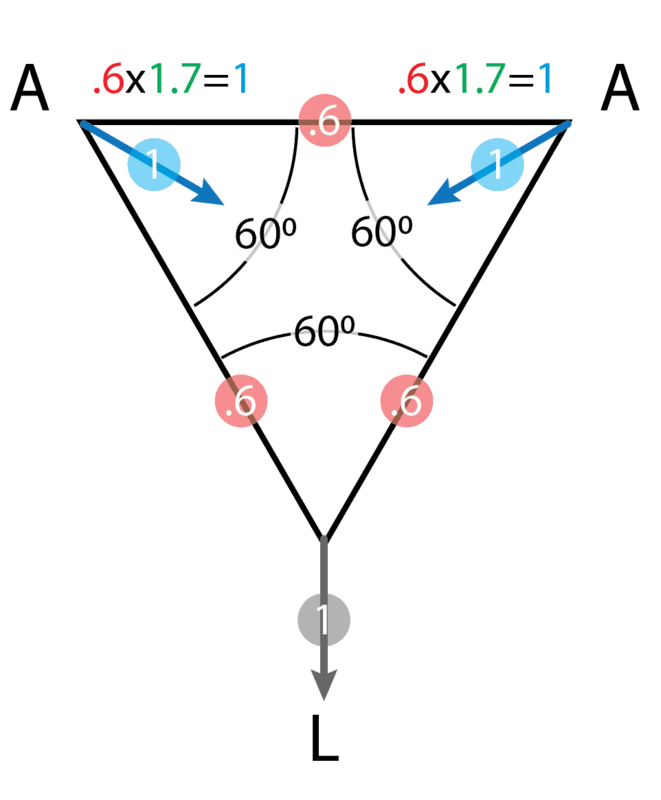 Resultant: A vector quantity which is equivalent to the combined effect of two or more component vectors acting at the same point, e.g., the blue arrow in the diagram. OK – still with me? Hang in there. Now some practical examples. In order for you to work out the ADT forces: get the vector forces for anchor and directional angles on one convenient page. Work out the factor on both LEGS and BASE (assuming no friction). 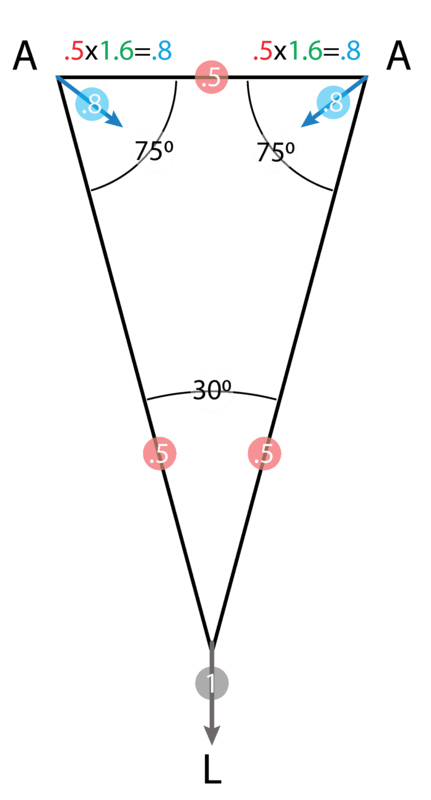 Anchor angle (APEX) is 30 degrees (Vector Forces Guide: Anchor – Angle – 30 degrees). Work out the directional factor for the BASE angles. Directional angle is 75 degrees (Vector Forces Guide download: Directional – Angle – 75 degrees). 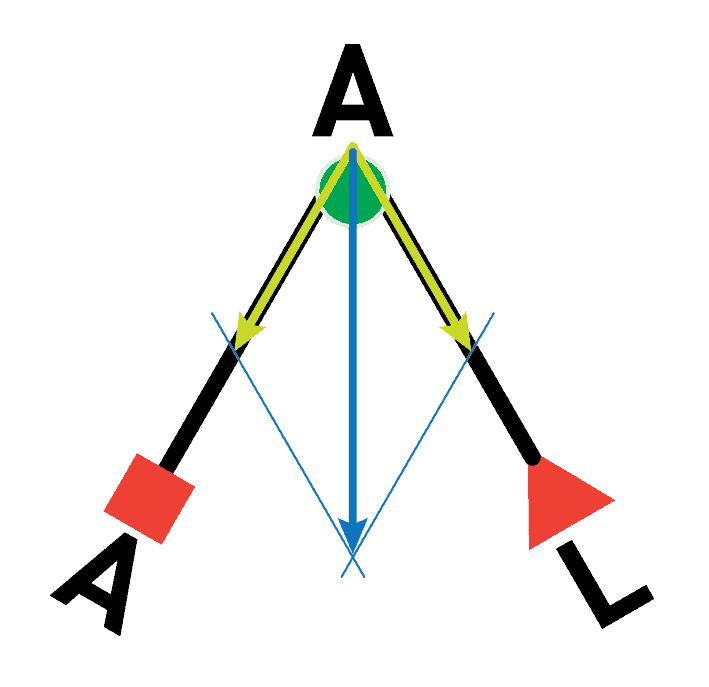 Work out the factor on the anchors (blue arrow) by multiplying leg/base and directional factors. Work out the factors on both LEGS and BASE. Work out the directional factors for the BASE angles. Work out the factor on the anchors by multiplying leg/base and directional factors. This example is an equilateral triangle. A useful mnemonic is ‘equal angles = equal load’ (on all three corners of the triangle). Work out the factor on both LEGS and BASE. There is a magnification of forces (or pulley effect) for the ADT when the APEX angle is more than 60-degrees. Below a 60-degree APEX angle, there is no magnification and a decrease in force on the anchors. So, why are we so worried about using the ADT for two point-anchor rigging? The ADT doesn’t decrease the force on the anchors a great deal, and above a 60-degrees APEX angle, the force increases. The ADT changes the resultant. This change can be the most significant issue for anchors that rely on a direction of pull to perform, e.g., rock protection. The ADT resultant is pulled towards the centre meaning your anchors may not work as intended or fail altogether. 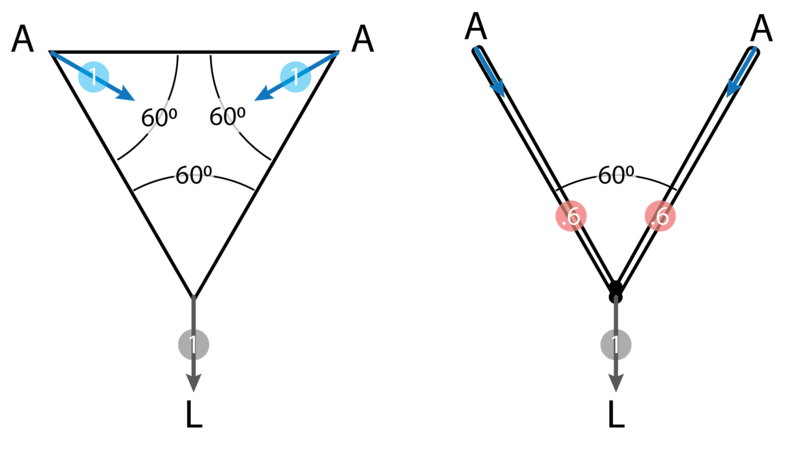 For example, (in the diagram above) the resultant (blue arrow) is pulling the anchors together on the ADT (left) compared to aligned down the rigging (right) for a 2-point load sharing anchor. For bolts, as they are omnidirectional, the resultant will have little to no effect on anchor performance. As the ADT rigging is often used with one piece of webbing it is not redundant. Also if one anchor should fail there can be a great deal of extension in the sling, dynamic load and likely cascading failure of the second anchor. Side by side ring bolts? So, what about abseiling with double ropes on side-by-side ring bolts? This is the question that was put forward at the beginning of the article. 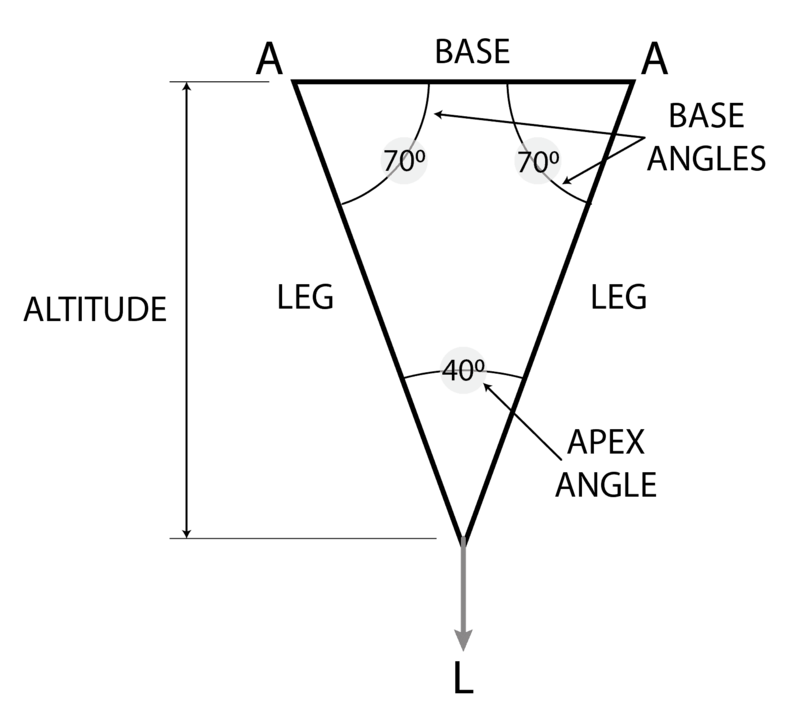 If the ALTITUDE of the triangle is the same length as the BASE, then APEX angle ends up being 54 degrees, and the factor on the anchors will be less than 1 (100%). Rule of thumb: Attach onto the double rope at a distance equal to or greater than the bolts are apart. For example, if the bolts were 200mm apart you need to attach a minimum of 200mm below. The smaller the APEX angle the less the force will be on the anchors. So, if it is practical to make this angle less by attaching a greater distance away from the bolts then take the opportunity. As you start abseiling the APEX angle often reduces with a resulting decreased load on the anchors. If we estimate well-placed bolts in solid rock would fail at 5kN+, this will give sufficient safety factor and redundancy for the context of abseiling. Side by side ring bolts anchors, ideally, need to be placed and aligned with the expected resultant in mind. Rig the anchors high, where possible, to allow for attachment further from the anchors. Occasionally we drive on the wrong side of the road – when we are overtaking. We take the precautions of checking for clear road in-front and behind, enough clearance for passing, indicate, speed up, indicate and pull back in. We, in effect, make a judgment call based on the information we have in front of us and manage the risk appropriately. Given the right set of circumstances, we can overtake safely. And so it is with the American Death Triangle. Occasionally we can use the ADT given the right set of circumstances where we can appropriately manage the risks. For example, abseiling with double ropes off two side-by-side ring bolts placed in good rock with an apex angle less than 60 degrees. 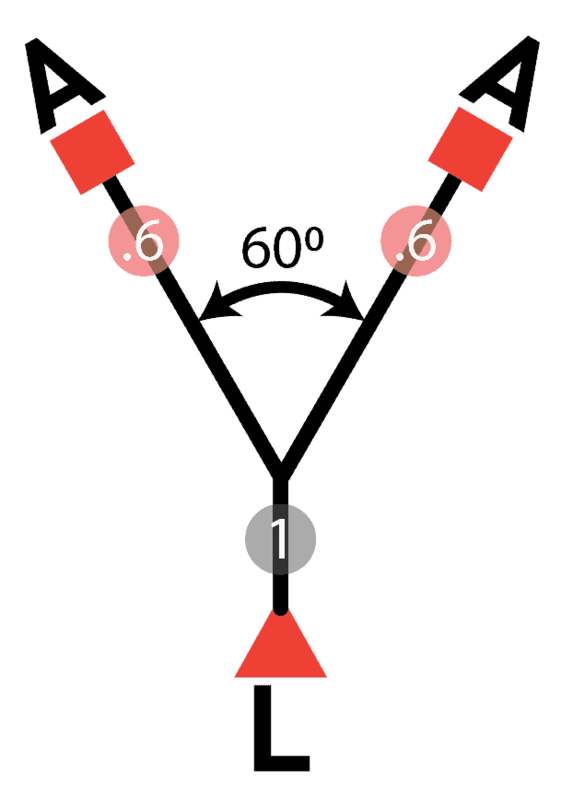 However, most of the time we want to be on the correct side of the road, using 2-point load sharing anchoring techniques.